Queens Of The Stone Age will return to New Zealand on their Villains World Tour this August. They will be joined by Australian blues maestro C.W. Stoneking. 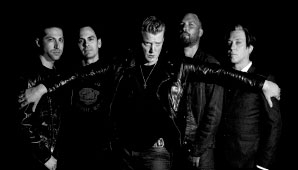 Helmed by founding member Joshua Homme(guitar/vocals), with Troy Van Leeuwen (guitar), Dean Fertita (guitar/keys), Jon Theodore(drums/percussion) and Michael Shuman (bass), Queens of The Stone Age will performing at Christchurch’s Horncastle Arena.